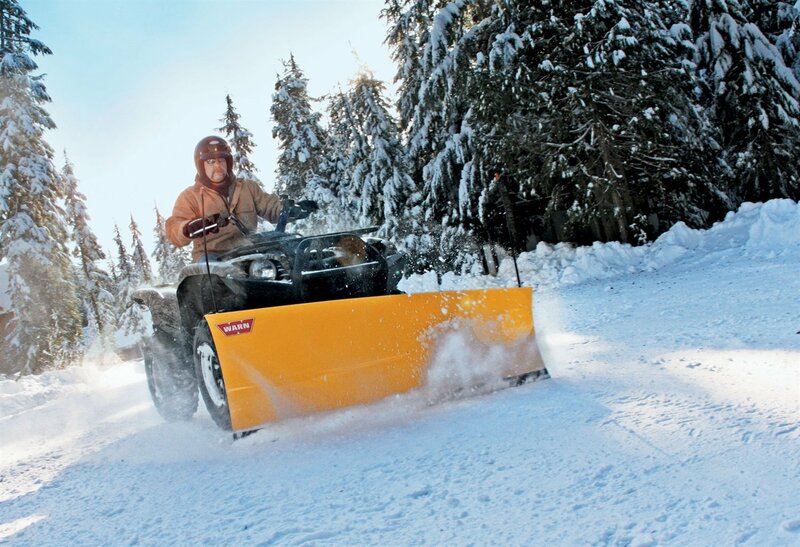 With winter just around the corner, you might be shopping for the best ATV snow plow. Such an accessory can save you hours of work and sweat so that you can clean your driveway in no time. However, finding the right product for your needs can be a tough task these days, with so many models on the market. We’ve scoured the market and analyzed many offers so we can select the ones that offer the most features for the money. After having studied and compared countless models, we recommend that you get the WARN ProVantage 54″ plow blade. It is made of high-strength steel, is wide enough to move a lot of snow, and it’s also is easy to install and use, thanks to the ingenious mounting system. In case this model is sold out, then you might want to consider the WARN ProVantage 60″. 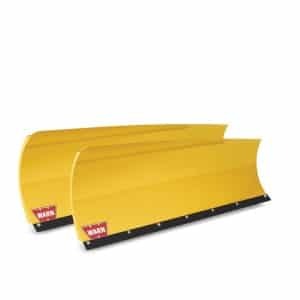 WARN’s ProVantage 80954 Plow Blade is the right tool if you need a reliable solution to quickly move snow out of the driveway. Besides the inspired design which allows an easy installation, this unit is also made of high-grade 11-gauge steel. Moreover, the special low-friction powder coated finish ensures that snow or other debris won’t stick to the blade’s surface, enabling the tool to be more efficient. You might want to protect the blade since if it hits hard objects the paint can get chipped, which can then lead to additional repairs. This heavy-duty plow it definitely one to consider if you want to rapidly remove the snow and get the job done in no time. Made of 12-gauge steel and reinforced with a heavy-duty rib-like structure, WARN’s ProVantage plow blade is a reliable tool that gets the job done in a fast and easy way. 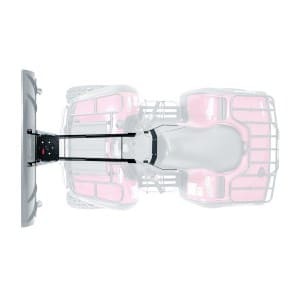 Given its 60-inch width, you can move large amounts of snow around, while the stable base ensures that every action is secure, avoiding potential accidents. The blade is also coated to prevent any materials from adhering to it. The 60” blade can be heavy, making the ATV hard to handle sometimes. However, a too smaller version would not be practical. If you’re looking for a reliable tool to help you move around large amounts of snow, then give this one a try. The best part about this model is that it comes with a universal hybrid mount that will fit most of ATV models out there. However, this is not the only benefit KFI’s 105500 model brings. Made of heavy-duty steel, including steel gussets, this is one tool that will help you move significant amounts of snow around. Moreover, the kit is easy to install, so you’ll be ready to start using it right away. The diagrams provided in the manual are rather small, so you might need to often refer back to them during installation. Built for heavy-duty use and fast results, this is definitely a tool you should add to your list before making your choice. If you don’t really have the time to read dozens of ATV snow plow reviews, then you can check our top choices and read our reviews so that you get to choose the right model for your ATV and ensure that you benefit from easy snow removal for many years to come. 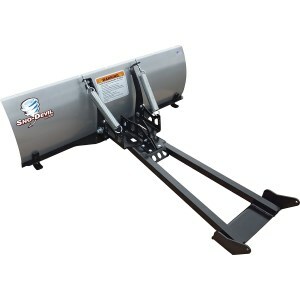 If you dread the upcoming winter and wish you had a way to move snow faster out of your driveway and alley, then the ProVantage plow blade is just what you need. 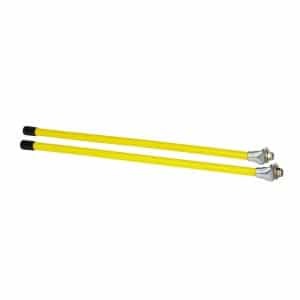 This accessory is durable, easy to install, and is wide enough to allow you to clean up surfaces of snow or dirt in a short amount of time. This blade has an aggressive curved design which allows it to scoop up snow efficiently. It is made of high-grade 11-gauge steel which benefits from extra ribbing to increase strength as well as support. Thanks to the non-stick powder-coating finish, snow or other debris won’t adhere to the blade’s surface, providing for easy cleaning anytime. The wear bar has a steep angle which allows it to scrape flat surfaces easily. With the wide 54-inch blade, you can move large amounts of snow and dirt and save a lot of time and effort in the process. Made from 12-gauge steel and reinforced with heavy-duty ribbing, the ProVantage is a plow blade you can always count on to do the job. Its sturdy boxed design allows it to handle snow, dirt, and other materials while providing plenty of support for ATVs or UTVs. Thanks to its 60-inch width, you can move large amounts of snow at any time while also benefiting from a stable base and avoiding any potential accidents. Its curved design and large plow skid can offer superior performance while minimizing wear. 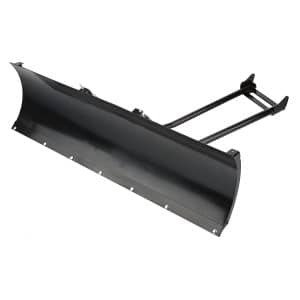 The wear bar and sharp angle-to-surface also make this plow blade both durable and efficient at moving snow. You get to enjoy smooth operation and minimum effort with the powder-coated blade which will prevent any snow or dirt from sticking to its surface. This accessory is very easy to install, and you can effortlessly remove it for inspection or cleaning. With an added pivot assembly, you can rotate this blade at any angle to suit specific needs. 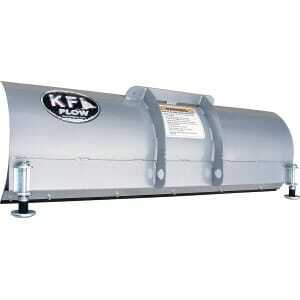 In case you’re looking for something to ease snow cleaning this winter, then the KFI Products Sno-Devil is a fine choice. Made from heavy-duty steel with steel gussets, this snow plow blade is made to withstand heavy work conditions and help you move large amounts of snow in no time. This unit also comes with a universal hybrid mount that will work on most ATV models. This snow plow kit is easy to install so that you can get started with snow cleaning right away. 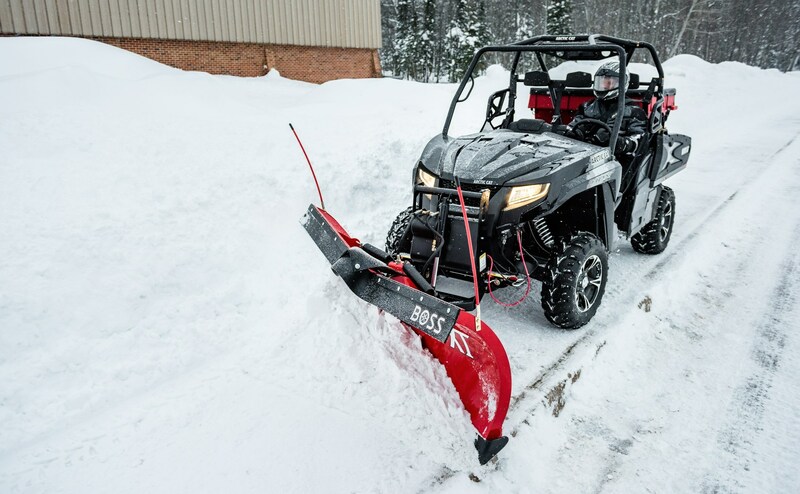 The blade is 48 inches wide, so it will help you move quite a lot of snow while not being too wide to cause stability problems or slow down your ATV. The blade also features a strong wear bar that is attached to the main body using eight high-grade bolts which won’t just increase durability, but also allow you to replace it after it wears down with ease. The MotoAlliance DENALI ATV 50 is a snow plow kit that will make snow cleaning a breeze. This kit has been engineered to provide superior performance at a low cost, so you don’t have to skimp on quality to enjoy an affordable unit. Made from 11-gauge steel and reinforced with four 7-gauge ribs, this blade is strong and durable and can withstand high pressures. Thanks to the center-mounted plow system, the entire assembly evenly spreads impact forces towards the frame of the ATV so that the most reliable parts absorb and disperse the energy. This kit also comes with push-tubes, skid feet, a plow mount, as well as two wear bars that will provide you with fast and efficient cleaning for a long time. This kit can be used on several Honda Rancher models, just make sure that it fits on your vehicle before buying. You can also add a winch for faster and easier operation. This KFI Products Snow Plow Blade is tough and durable, benefiting from a strong design that uses 11-gauge steel and 3.16-inch gussets. This model is reinforced in the center for extra endurance. 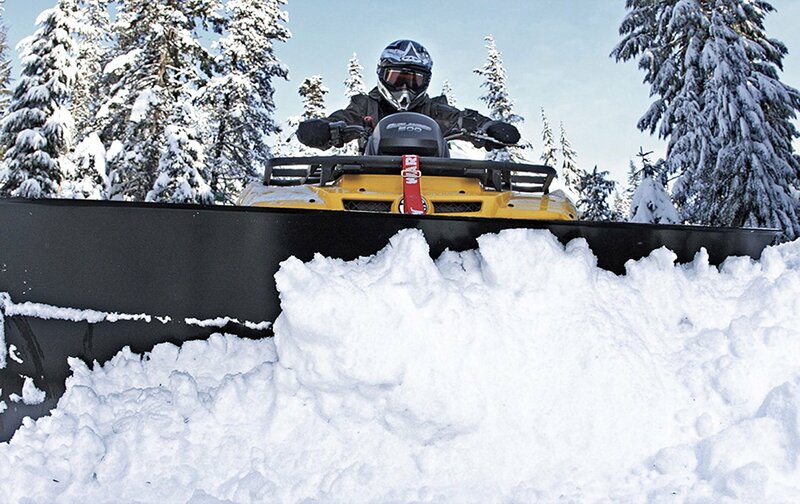 Measuring 48 inches in length, this blade provides a balanced performance between speed and snow moving capabilities, making it a great choice for many ATV owners. The blade is shot-blasted and then powder-coated to make it stronger as well as to help it shed snow and other materials easier and stay as lightweight as possible for easy and agile maneuverability. You can add lowering and raising functionality by getting a quality winch and attach it to the plow system. This unit also comes with a 2-sided steel wear bar which is fixed to the main body using eight bolts. Not only is it easy to install and remove, but it is also highly durable, thanks to the use of Grade 50 steel, an alloy that has a much higher strength per weight unit than comparable carbon steel. If you want to be prepared for moving lots of snow this winter, then you will surely benefit from a few extra accessories. You can get a sturdy front mount for easier installation, replacement springs for trip functionality, or buy some markers to make the plow edges more visible and improve safety. Whether you want to move mountains of snow next winter or just, need to clean your front alley and driveway, getting the Kolpin Plow Marker Kit can ensure that you stay safe while working in tough conditions. These are highly visible markers that you can attach to the edges of your snow plow. Doing so will make the entire plow more visible for you and others. You could avoid potentially dangerous scenarios, injuries, or damage to your ATV and plow. You can easily attach these markers by using two bolts and nuts. With extra visibility, you can better approximate where the plow is relative to landscaping elements and avoid hitting the sidewalk edges and possibly ruining your plow. By knowing exactly where the edges of the plow are, you’ll also be able to move snow faster so that you spend less time out in the snow and more inside your home. If you want to make sure that your plow can “trip” when hitting hidden objects and then recover in the normal position immediately afterward, then getting the WARN Spring Plow Blade Service Kit is a good idea. This kit contains two springs and fasteners to ensure that the plow blade stays in the correct position while avoiding accidents. The springs are made of heavy-duty steel which makes them strong and elastic. With these mounted on the plow system, you ensure that the blade is able to trip and safely pass obstacles hidden beneath the snow so that you don’t damage it. 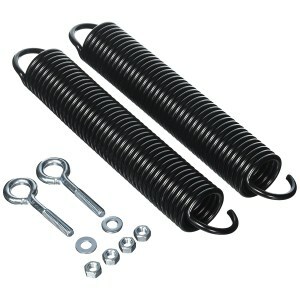 You can easily install these to replace broken or worn springs by using the provided fasteners and simple nuts. Without a dual-spring mechanism, the plow could get stuck in the snow, and you could risk damaging the blade, the mount, or even your ATV. With these quality replacements, you get to prevent accidents and damage and get smooth operation for easy plowing all winter long. 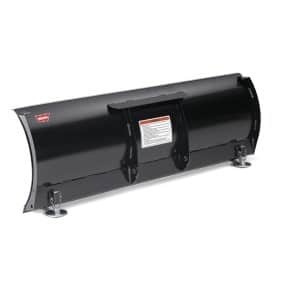 The WARN Plow Blade Control Flap is an essential accessory that can prevent snow from kick-backing and cause inconvenience or even accidents. Made of heavy-duty flexible rubber, this unit can be attached to plow blades of different sizes. Plowing through the snow at high speeds can be fun, but it can also pose risks, especially when the snow is fluffy. The plow can cause snow kick-back, and the last thing you want is to have snow thrown in your face while driving your ATV. With the rubber flap, you ensure that snow won’t affect your visibility so that you can continue your work safely. This accessory is easy to install; you just need to use the provided bolts and nuts. With the added washers, you also get to ensure that the bolts don’t pull through the material. This unit measures 60 inches in length, but you can attach it to plow blades that are 54 inches or even shorter, as long as you cut off the excess material. If you’re tired of having to crawl under your ATV every time you need to install something, then the WARN ProVantage Front Plow Mount Kit is surely something you’d appreciate. This sturdy mount is durable, easy to install and take off, and the best part is that it’s always accessible for tweaks and repairs. This plow mount kit is engineered to attach to the front of your ATV so that you can benefit from easy work from a convenient position. All the elements are integrated into an ingenious design that’s effective and strong. Thanks to the self-locating pin, you can easily put the mount on or take it off with a minimum of fuss. You won’t need to take the mount off once winter is over thanks to its high ground clearance which won’t hinder movement. You’ll also get the chance to use this unit in summer to level an area, move dirt, or spread mulch over your garden. With the WARN Center Plow Mount Kit you can easily turn your ATV into a high-power snow removal machine. This kit is built with durable metals which allows it to withstand harsh weather and high pressures even when moving large amounts of snow. This unit is engineered so that all parts can be assembled together in a short amount of time using the included instructions. The mounting plate is designed to remain on the front part of the ATV and provide increased rigidity and structural resistance against large forces during plowing maneuvers. Thanks to the quick-release pin, you can easily attach the plow blade or take it off. You won’t actually need to remove the mounting plate during the off-season due to the high ground clearance. 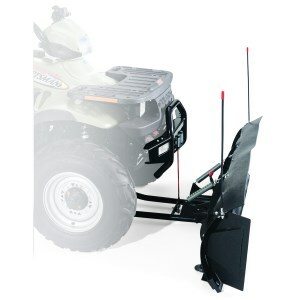 This versatile plow mount kit can be used on a variety of ATVs, although some users have suggested that it can only be used together with a Warn lift actuator. If you want to ensure you’re prepared for whatever this winter is bringing, then getting the best ATV snow plow system is definitely at the top of your list. There are lots of models to choose from, with plenty of blades, mounting plates, and accessories up for sale. However, picking the right ones requires that you know a few essential things about ATV snow plows. When looking to buy an ATV snow plow blade, you need to make sure that you get the right size. For ATVs with 450cc or lower, it is recommended to choose a blade that’s around 50 inches or so. For ATVs above 450cc, you can go all the way up to 60 inches. Wider blades are usually only used on more powerful UTVs. You also need to be careful about the height of the plow blade, as narrower blades are good for smaller ATVs while wider ones are better suited for higher capacity models. The shape of the blade is also important. You can go with a straight blade, a V-shaped blade, or a containment blade. The straight blade is simple and versatile and you can change the angle. The V shape is better for breaking through packed snow or ice, while the containment version is good for moving snow around. Most snow plows are made from steel alloys, although you can also find models made from hard plastics. Some alloys also include rare metals for extra strength per weight unit, making for a much stronger assembly. Many models also feature a wear bar that can be attached to the blade and prolong the life of your plow. You can raise or lower the plow by adding a lift system that can be either manual with levers, a winch, or a hydraulic system. The manual system is obviously the cheapest, although it will require quite a lot of brute force to operate. You will also need to get off the ATV multiple times to readjust the blade, which can be quite frustrating, especially when you have lots of work to do. If your ATV is already equipped with a winch, you might want to check that the plow model you are planning to buy is compatible with it; some plows work with a variety of winches, while others might require a specific model, sometimes even from the same manufacturer. A hydraulic model is going to offer the best performance and an effortless operation, but you can expect to pay a lot more money on it compared to the other lift systems. By getting some accessories you could also add functionality and improve the performance of your ATV and snow plow. You can ensure better traction by buying the best ATV snow tires for plowing, which could boost performance as well as prevent accidents due to slippage. You could also improve visibility and make the plow easier to see and use with plow markers. With these equipped, you can clearly see the edges of the plow so you don’t accidentally bump into objects or sidewalk edges. There’s also the possibility of adding a control flap so that you prevent snow from being kicked back into your face. 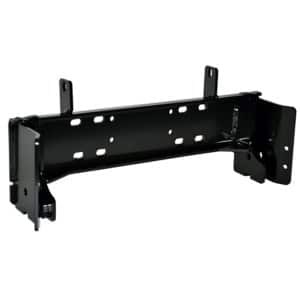 There is also a wide range of mounting plates, push tubes, or complete snow plow systems you can choose from depending on your needs and budget. Are ATV snow plows universal? While most snow plows can fit a wide range of ATVs, it might be a good idea to make sure that the version you are planning to get fits your particular model before buying. Depending on the size and power of your ATV, you might also need to buy a wider or narrower plow blade so as to ensure that you don’t lose efficiency with a narrow unit, get stuck in snow or have your ATV pushed back with a wide blade. You should also need to be careful about the mounting mechanisms; many snow plow kits get attached to the frame of the ATV while others on the front of the vehicle. Are ATVs good for snow plowing? Getting a snow plow for your ATV is a great idea since it can help you move a large amount of snow while saving you countless hours of back-breaking work. While an ATV equipped with a snow plow won’t be able to remove snow, it will be capable of moving it from alleys, driveways or rural roads by pushing it aside. However, you should be aware that ATVs do get limited when it comes to plowing compacted or wet snow that’s thicker than 6 inches or more. Choosing a suitable plow blade design can also help improve performance. How can I adjust an ATV snow plow? Even if you properly install the snow plow in the first place, you may need to perform several adjustments between jobs or sometimes even in the middle of a cleaning session. The most common adjustment you can make is to change the blade angle to move snow more efficiently or deposit it only on one side. You can do this by rotating tilt stops or removing retaining pins, changing the angle and then tightening the bolts again. You may also change the attack angle of the plow blade, or loosen/tighten the tension in the trip springs. Skids can also be adjusted by adding or removing washers. How to install an ATV snow plow? 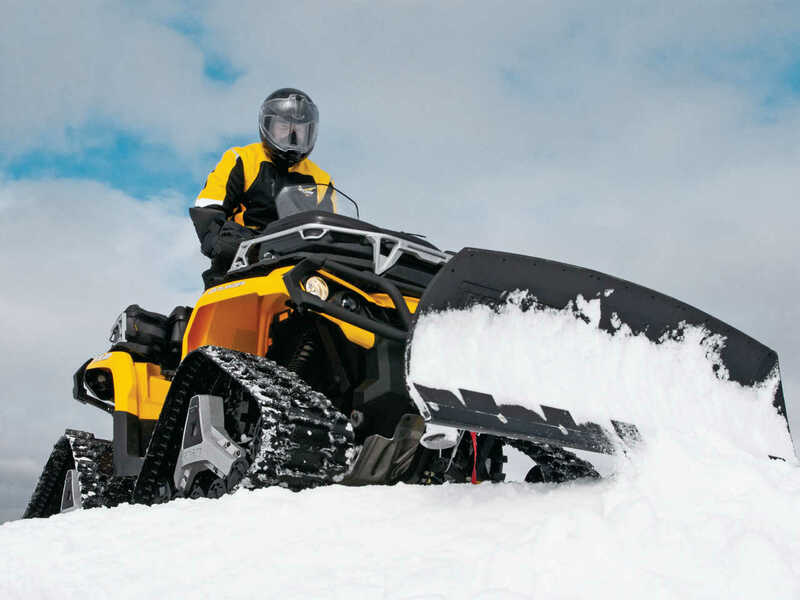 While installing an ATV snow plow will depend on the specific model and manufacturer specifications, there are some general steps you may need to take to ensure a proper fit. The first thing you will have to do is to install the mounting plate, which normally goes beneath the ATV, attached to the frame. Some models can be mounted on the front and don’t require lifting. You will then need to attach the plow push tube to the mounting plate using pins, latches, or bolts and nuts. The last step is to attach the plow blade to the push tube while making sure you follow the instructions from the manual. How does an ATV snow plow work? All ATV snow plows will be able to push or move snow out of alleys or roads. Depending on the blade design, the snow plow can push snow differently. A straight blade will normally push snow outwards on both sides, creating a clear path with accumulated snow on the edges. Pivoting snow plows can also move snow in only one direction, which is helpful in clearing wider areas. A V-shaped snow plow can be great for moving packed snow and for breaking the ice, helping in more difficult snow cleaning tasks. Depending on the type of job you need, you should choose the snow plow model accordingly. The company was initially founded as Hetteen Hoist & Derrick by Edgar and Allan Hetteen and David Johnson in 1945 in Roseau, Minnesota. The company manufactured and tested one of the first snowmobiles in the world in 1955. After gaining international fame, they started making ATVs, becoming one of the most popular brands in the industry. Yamaha was founded by Torakusu Yamaha in 1887 in Japan, initially manufacturing pianos and reed organs. The company produced its first motorcycles in 1954 only to diversify its range, including manufacturing the first ATVs in the 1980s. Since then Yamaha has become one of the leading manufacturers of ATVs as well as other vehicles and musical instruments. The best-known motorcycle manufacturer in the world since 1959, Honda produced their first 3-wheel ATV, then called an All Terrain Cycle, in 1970. Since then, the brand has become a household name in the industry, producing widely acclaimed models, such as the FourTrax Rancher, Foreman, as well as the high-end FourTrax Rincon. 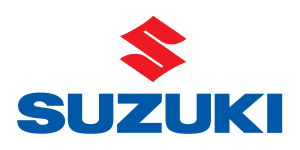 Founded in 1909 by Michio Suzuki, this company initially built weaving looms, diversifying in 1937 to build cars and creating its first motorized bikes in 1952. In 1982, it became the first company to ever produce a four-wheel ATV. Since then, it has continued to innovate, creating better and stronger ATVs that can perform a variety of jobs, including snow cleaning. Kawasaki was founded in 1896 by Shozo Kawasaki. The company’s first ATV was built in 1981, and it had only 3 wheels. Its first 4-wheel ATV, the Bayou 185, was introduced four years later, with the first 4×4 model appearing in 1989. Today, the company manufactures a wide range of ATVs, from recreational models to high-powered utility vehicles.